Rogues Point is a locality in the Australian state of South Australia located on the east coast of Yorke Peninsula immediately adjoining Gulf St Vincent about 80 kilometres (50 miles) north-west of the Adelaide city centre and about 6.9 kilometres (4.3 miles) of the centre of Ardrossan. As of 2014, the land use within the locality is divided into the following two zones that are parallel to the coastline - a strip of land zoned as “coastal open space” which is reserved both for community use and as a buffer against sea level rise, and a strip of land zoned as “settlement” which consists of an area of low density residential and associated buildings. 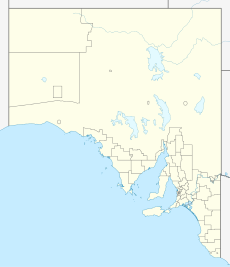 Rogues Point is located within the federal division of Grey, the state electoral district of Narungga and the local government area of the Yorke Peninsula Council. ^ Australian Bureau of Statistics (31 October 2012). "James Well". 2011 Census QuickStats. Retrieved 25 February 2016. ^ a b c d e f g "Search result for "Rogues Point (Locality Bounded)" (Record no SA0059386)". Property Location Browser. Department of Planning, Transport and Infrastructure. Retrieved 25 February 2016. ^ a b c "Rogues Point, South Australia (Postcode)". postcodes-australia.com. Retrieved 25 February 2016. ^ a b "Development Plan - Yorke Peninsula Council" (PDF). Department of Planning, Transport and Infrastructure. pp. 120, 133, 327–329 & 447–449. Archived from the original (PDF) on 4 June 2015. Retrieved 25 February 2016. This page was last edited on 23 April 2018, at 09:18 (UTC).